Over the years I’ve spent a lot of time and effort exploring my passions. The saying, "follow your bliss", is significant. If you aren’t happy doing what you are doing then you need to find out what excites you, what has meaning and purpose, what gets you out of bed in the morning. Personal history and life story preservation is not my only passion. I love music, the Internet, spiritual development and teaching. The interesting thing for me is that all of the above are connected in my ongoing work through Your Life Is Your Story. I hit on the idea for my web business after investing in Site Build It from Sitesell.com. I’m ever so grateful that I discovered this amazing product/service that has allowed me to pursue my passion successfully with an online BUSINESS, not just a blog or social media site. It has not always been easy, but the tools and the system of SBI really works wonders when I do the simple steps. I tell you this because you might be exploring a passion and looking for a way to develop it online. Don’t waste your money on "quick fix" systems or free hosting that doesn’t get the results you need. Your destiny is to fulfill your passion and I urge you to check out at no cost and no risk what SBI is all about. By the way, right now you can even get two SBI sites for one price – it’s the annual Holiday Special. Whatever your passion I wish you success in pursuing it. Find your destiny and live it – that’s a great legacy. All of us will one day face it; not everyone thinks about it. In fact, most people are in denial. They don’t contemplate it happening to them. Just what are we referring to? The “D” word – death. Sooner or later, it comes to us all. Our mortality is a fact. Preparing for it is a good idea. Not dwelling on it, but preparing for it. So, what can we do? To start, we can live everyday to its fullest. Have a zeal for life. Have an appreciation for the gift of living. In addition, do spend time planning for what you would like your loved ones to receive from you after you die. Here is one of the greatest reasons for preserving your life story. It is a story of your experiences, what life means to you, and what others mean to you. One of the greatest gifts that any of us can receive is a “goodbye gift”. It is the gift from a loved one in the form of a written letter, essay or book that passes on a message of love, values and any instructions or directions you may want others to have after you’ve passed on from this life. A new book from writer and grief expert, Gemini Adams, Your Legacy of Love, is full of wonderful and vital suggestions for just how to go about leaving the "Gift in Goodbye". The author discovered the hard way how difficult it is to not have such a written legacy when her mother died of cancer at a young age. She longed to have this "goodbye gift" from her mother. It has taken her years and a great deal of research to put together this resource that details how important it is for each of us to realize the gift of goodbye. More than financial assets, most people long to have emotional assets: the values, lessons, voice, image, wisdom and affections that make up a loving legacy. The message in Gemini Adam’s book is positive, uplifting and yet completely practical. She discusses how to get beyond a culture of denial about death and to embrace a life that includes considering leaving a written legacy of values and caring messages. She uses examples from others and stimulates your imagination as well as giving you practical steps to begin your own goodbye gift. I’ve had a chance to speak with the author and I can tell you Gemini Adams is genuine and strongly motivated to share her inspirational message. You can find out more at her website, www.RealizetheGift.com. Her book is divided into three key sections -Realize, The Gift, and In Goodbye. Her personal experience and research will inform you with a wealth of creative ideas, resources and specific ways to prepare your stories, heritage and memories so you can leave a legacy of love. We’ve secured a special limited time, offer for readers of this Your Life Is Your Story newsletter to purchase her book at an amazing 50% discount. The book normally retails for $14.95 – get your copy today for $7.99 + pp by visiting this special link. Enjoy the book and use it to realize the great Gift in Goodbye. Discover other articles by Tom Gilbert on life-story writing here. This terrific e-book life story writing guide by Michael Boyter is a consistent best seller and popular resource. The MemoryGrabber contains great ideas to stir memories and inspire you to begin preserving your life story. I frequently use it with my clients. It is an incredible value at a very affordable price. You can even try it out risk free with a money back guarantee. Find out more here. 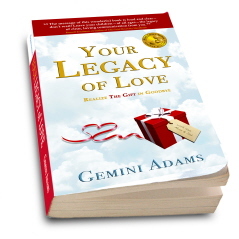 Recently we came across a great new book, Your Legacy of Love: Realize the Gift in Goodbye, by multiple award-winning author, Gemini Adams, which has an entire chapter dedicated to writing and sharing your Life Story. This practical guidebook provides a wealth of creative ideas and resources and for a limited time you can purchase it for a 50% discount – half off! Go here for the special link.